With no other hope of escape and feeling vulnerable to anyone that comes along, many trapped animals resort to amputating their own leg. Trappers callously label this grim act of despair “wring-off”. Truly, freedom is precious to any animal desperate enough to take this extreme step. But if they don’t bleed to death or die from infection, they spend the rest of their lives crippled and quite possibly unable to keep up with a demanding life in the wild. I’ve had more than my share of heart-wrenching experiences with the gruesome evils of trapping. On a walk near our home in Eastern Washington, my dog stepped into a leg-hold trap that clamped down onto his front paw, prying his toes apart. He cried out in terror and frantically tried to shake it off, biting at the trap, at his paw, and at me as I fought to open the mindless steel jaws. The trap continued to cut deeper into his tender flesh and my efforts caused him even more pain. Finally, after many harrowing minutes, I was able to loosen the torture device enough for him to pull his foot free. Another dog I freed was caught in two leg-hold traps. One was latched onto her front leg, while the second gripped her hind leg, forcing her to remain standing for untold agonizing hours. Judging by how fatigued and dehydrated she was, she had been stuck there for several days. The sinister traps caused so much damage that a vet had to amputate one of her injured legs. With no other hope of escape and feeling vulnerable to anyone that comes along, many trapped animals resort to amputating their own leg. Trappers callously label this grim act of despair “wring-off”. Truly, freedom is precious to any animal desperate enough to take this extreme step. But if they don’t bleed to death or die from infection, they spend the rest of their lives crippled and quite possibly unable to keep up with a demanding life in the wild. 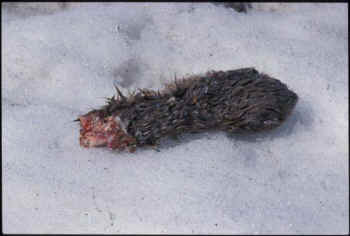 Unlike the fictional character “Little Big Man,” who was distraught to the brink of suicide when he found that an animal had chewed off its leg to escape one of his traps, most trappers who find a wring-off are indifferent to the suffering they caused as they begrudgingly pitch the chewed-off limb and reset their trap. While I was camped near Bowron Lakes Provincial Park in B.C., Canada, in late March, my dog found just such a discarded limb–the front leg of a trapped lynx. In what has to be one of the more deceitful abuses of trust ever, free roaming animals– safely protected within the arbitrary boundaries of parks– lose all such protection and are deemed “fair game” for trapping as soon as they step across an invisible dividing line. Trappers consider the lands adjoining parks the most “productive” and will pay tens of thousands of dollars for permits to run trap-lines in those areas. I’ve had the displeasure of seeing three-legged coyotes near the North Cascades National Park, and within the Grand Tetons National Park. Sidestepping the indisputable cruelty issue, pro-trapping factions try to perpetuate the myth that trapping is sustainable. But time and again entire populations of “furbearers” are completely trapped out of an area, often within a single season. The winter after I found wolf tracks in Alaska’s Katmai National Park, all seven members of a pack who had found a niche in and around that preserve were killed – permissibly “harvested” – by trappers. Though wolves are extinct or endangered in most of the U.S., 1,500 are legally trapped in Alaska each year.